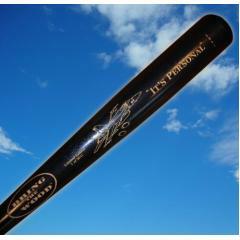 Rex Ryan Autographed "It's Personal" Bat from the Bring the Wood Bat Co. Note: Bat image shown here is the actual model. Signatures will be added by Rex Ryan following the season. New York Jets Head Coach Rex Ryan doesn't like to mince words. He says what ever is on his mind, and if he says "it's personal," then you better believe he means it. Ryan and the Jets have lived up to those words in knocking off the rival Patriots and heading into the AFC Championship Game with a ton of momentum. This rare collectible bat is the perfect symbol of the Jets approach to the season. 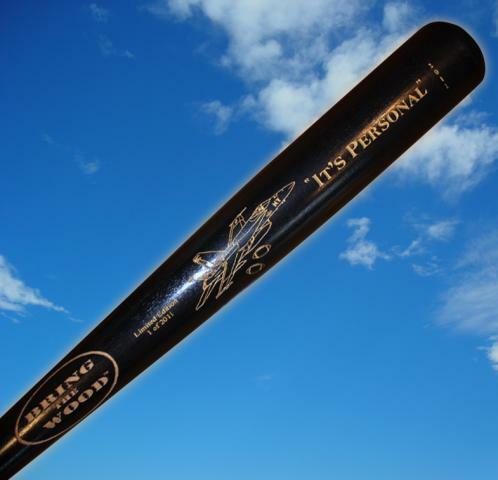 Presented exclusively by the Bring the Wood Bat Co., a division of the Who Dat Bat Co., this is a limited edition "It's Personal" bat personally autographed by Rex Ryan. Order now before they are all gone. What makes this bat so unique is the fact this it is actually a full-sized black maple baseball bat. Laser engraved into the barrel is the image of a Stealth Bomber dropping a payload of footballs, along with the words, "It's Personal," and the year "2011." The laser engravings are gold-filled so to POP off the black bat background. This unique team collectible will look great on the wall of any Jets fans home or office. Order now and be the only Jets fan on your street to have one. This autographed bat is strictly limited to just 500 pieces hand-signed by Rex Ryan in gold marking pen just under the "It's Personal" engraving. The signing will take place after the season is concluded under the supervision of Steiner Sports Marketing of New York, Ryan's exclusive signing agent. Each bat will arrive with a FREE wood bat display hanger that will allow you to display this bat and a Certificate of Authenticity from Steiner Sports for all your friends to see. Order yours now. Due to the limited number of signed bats we will charge your credit card for the full amount of this purchase as soon as receiving your order to ensure we reserve your edition piece. We will confirm your order by Email. Bats will deliver in the days immediately following the signing event. This bat is not game used.